L.C. 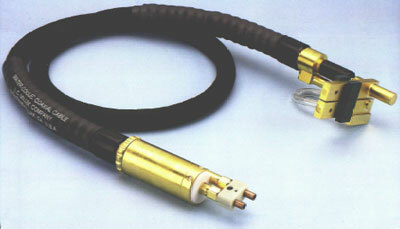 Miller offers many different models of Water-Cooled Coaxial Cables. These cables are ideal when the performing of a heating operation away from the generator is required. The cables are compatible with manual, automatic and robotic systems. Efficient transfer of radio frequency energy from the generator to the induction coil where the heating process occurs. Minimum R. F. radiation interference. Electrically safe. Shock hazard is eliminated as the outer conductor of the cable is electrically grounded. Litz wire inner conductors provides maximum R. F. transmission efficiently with maximum flexibility. Ideal for applications where the coil is either moved manually or robotically from one position to another as in soldering or brazing operations. The use of a coaxial cable instead of parallel leads lowers the inductance, resulting in higher efficiency and minimum R. F. radiation interference. Characteristic impedance typically 10 ohms.. Inner conductors from 36,000 CMA to 175,000 CMA are available from 30 kw and above. Cable lengths from 3 feet to 50 feet are available. Send for complete induction packet which shows our various cables, and many accessories. The L.C. Miller Company specializes in the design and manufacture of custom induction coils and fixtures. Engineering assistance is available, without obligation, upon request.